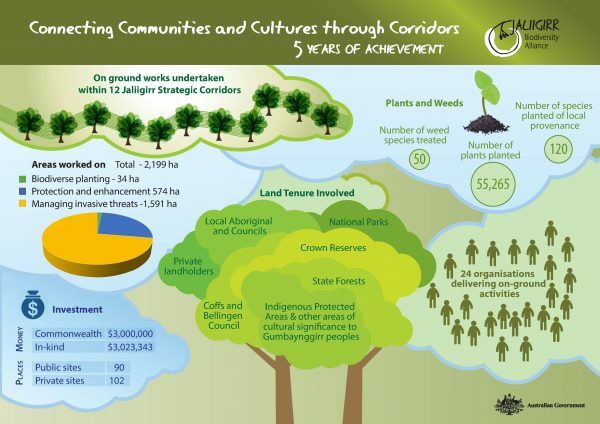 55,265 plants in the ground, 50 weed species removed from 1,591 hectares of bushland and another 574 hectares of bush protected across private & public lands of our region – these are some of the results of Jaliigirr partners working together ! 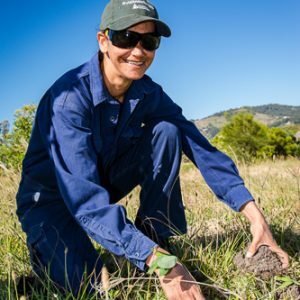 At a celebration event held at the Cedar Bar & Kitchen in Bellingen recently, Jaliigirr Biodiversity Alliance partners and supporters showcased five years of activity and achievement. “ We all need to show our respect for country and care for country together ” said Auntie Shaa Smith. In his opening address, Mayor Dominic King, Bellingen Shire Council emphasised that “working together has been a great success for us all”. With visitors from Canberra hearing the positive results of Federal Government investment in Jaliigirr project works, the gathering of over 60 contributors had lots to talk about. Partners told their stories from working in the high country with cattle producers in the Upper Bobo to working in amongst the coastal sand dunes at Urunga lagoon. Highlights included hearing personal stories of Darrunda Wajaarr and Dorridong repair to country teams and local landholders working away on their properties around Bellingen. Project partners include Bellingen Shire Council, Bellingen Landcare, Coffs Harbour City Council, Coffs Harbour & District Local Aboriginal Lands Council, Dorrigo Local Aboriginal Lands Council, EnviTE Environment, Forestry Corporation NSW, National Parks & Wildlife Service and North Coast Local Lands Services.